The juvenile and adult in autumn plumage are very similar, the underside and eye stripe are much more primrose yellow than the adult in spring and summer plumage. Typical view of a Willow Warbler, note the sleek body shape, prominent eye stripe, pale bill and clean bright underside. This bird also shows the slightly mottled ear coverts and the partially open tail indicative of the Willow Warbler. Very common and widespread summer visitor to Northern Europe and the UK. Can be found even in the far North of Scotland. Frequenting scrub, hedges, orchards, and woodland. Can even be found in small wind blown bushes of highland areas. One of the UK's most widespread summer visitors, almost any area of broad leaf scrub or woodland will provide a suitable breeding habitat. Plumage gets progressively duller the further North the bird breeds, but is generally brighter than the Chiffchaff. 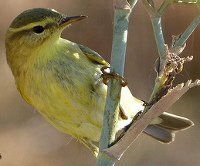 The Willow Warbler will often catch insects by hovering like a Flycatcher. 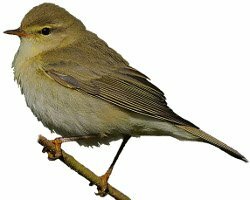 The best way to distinguish between Chiffchaff and Willow Warbler is by song.